Few pieces of home gym equipment offer as much value as exercise bikes. More affordable models make for an enjoyable cardio workout that’s much easier on the joints than running. On the other hand, cranking things up a little replicates the same level of intensity that cyclists experience on the road, except you’re kept safe from the elements. 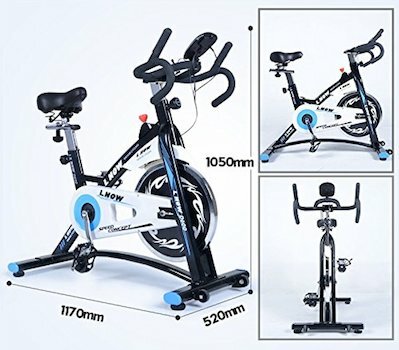 Exercise bikes are available at a wide range of price points, with respective feature sets and levels of build quality. Generally speaking, the phrase “you get what you pay for” is very much applicable, however you don’t want to drop a large sum of cash on a piece of equipment that doesn’t meet your needs. And so, we’re here to help. In this article, we take a look at the best upright exercise bikes for almost anyone, and the best high-end bikes. What Makes a Good Upright Exercise Bike? As we mentioned earlier, certain exercise bikes are geared towards certain athletes. Higher end models are for serious cyclists who need a convenient indoor alternative to traditional bicycles. More affordable models are better geared towards those who want an enjoyable, low-impact cardio workout. The following five bikes are in the latter category. Kicking things off is a bike that manages to cram in a ton of features at a competitive price point. With just under 30 programs, 12 profiles and a variety of custom presets, the computer is the star of the show. 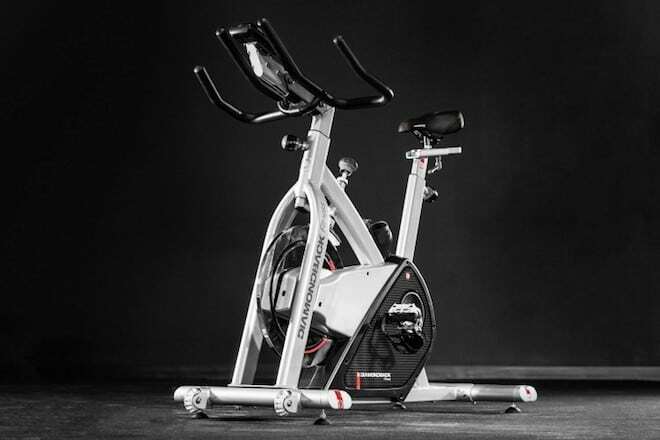 Bluetooth connectivity allows you to sync up with Schwinn’s Trainer app, giving you easy access to all the metrics and data collected after each session. The 170 is also compatible with the RideSocial app. This allows you to ride with your friends in a live virtual world. 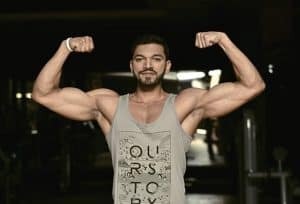 If your smartphone is the last thing you want to see when working out, the two built-in LCD displays provide all the information and settings you need. Comfort was clearly a serious focal point of the Schwinn 170’s design. A built-in 3 speed fan keeps you cool while you sit on the adjustable, padded and contoured seat. USB and MP3 ports allow you to charge your devices, as well as play music through the in-console speakers. Schwinn has also included a smooth, weighted flywheel and 25 resistance levels to top it all off. 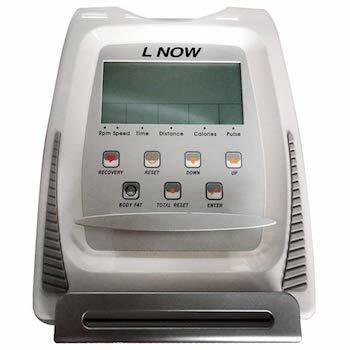 Unlike most exercise bikes, the D808 from L NOW uses a magnetic tension control system to provide eight different levels of resistance. Large, ergonomic handles surround the built-in computer. With it you can monitor your heart rate, distance, speed, time, calories and numerous other metrics. Below the LCD display you’ll find a stand for books, magazines, tablets and anything else to keep you entertained as you pedal. The frame completely encloses the mechanics, giving the D808 a cleaner and safer design. It’s also hollowed out to keep the flywheel cool over long sessions. Another important factor that defines the comfort and build quality of an exercise bike is the pedals. Those found on the D808 feature adjustable straps to prevent slippage. The seat is adjustable both vertically and horizontally. A pair transport wheels up front make the D808 easy to move around. 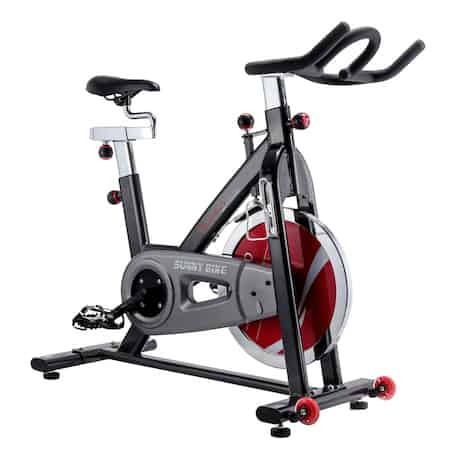 If you’re looking for an exercise bike that’ll last, the SF-B1002 is a great choice. A heavy duty steel frame holds the smooth, silent belt drive and solid chromed flywheel in place. 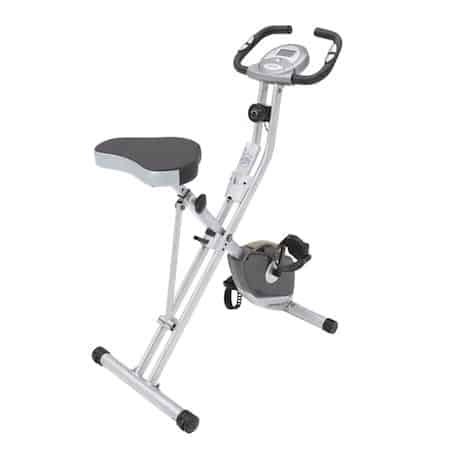 The padded seat is fully adjustable, along with moveable handlebars for a comfortable workout. The frame is solid enough to handle intense bursts without shaking around. Yet, paired with the built-in wheels, the bike is easy to move around. A bottle holder sits within arm’s reach to keep you hydrated during long workouts. The solid metal flywheel has variable resistance levels and mimics the smooth momentum of a real bicycle. Being a fraction of the price you’d pay for other bikes on the list, there’s no computer on this model. Instead, resistance can be adjusted with a physical knob near the handlebars. Spiked foot pedals with adjustable straps come standard to prevent any slippage when pedaling. 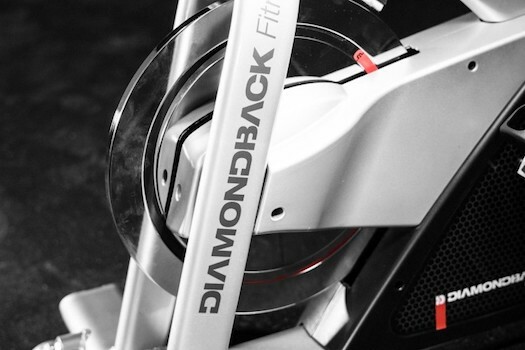 Rep Fitness’ take on the exercise bike is rich in features and serious with build quality. 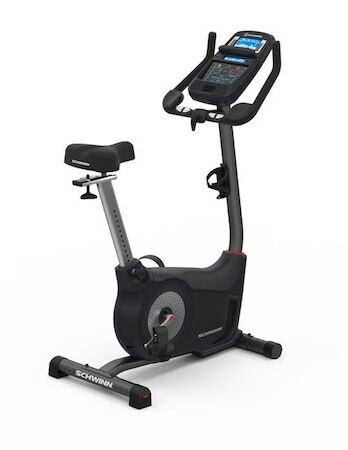 20 preset workouts, built-in heart rate sensors and a variety of settings are available through the large LCD display. The saddle, handlebars and even the center console are all adjustable to provide the best angle for your height. Additional comfort features include auxiliary audio input, multi-speed cooling fans and a fold-out rack for your media. The pedals are textured and feature adjustable straps. Same day shipping and a one month money back guarantee come standard with every purchase. A clean metal frame gives the 510UB a suitably premium look and feel. It’s also completely enclosed for additional safety, with a perforated grille around the flywheel. This allows you to cycle for longer without worrying about overheating the bike. If you’ve looked around a bit, you’ve probably come across an exercise bike or two that features a foldable design. While this does make them more portable, they’re usually a lot more flimsy. Exerpeutic’s folding bike is one of the better options out there, with a solid steel frame that supports up to 300 pounds of weight. It’s driven by a magnetic tension control system that provides eight different resistance levels. Pulse sensors on the handles allow you to monitor your heart rate without the need for additional accessories. A smooth and quiet belt drive connects your pedals to the precision balanced flywheel. Folding it reduces the footprint by half, making it ideal for smaller spaces. The LCD display provides numerous metrics such as speed, calories, time and distance. 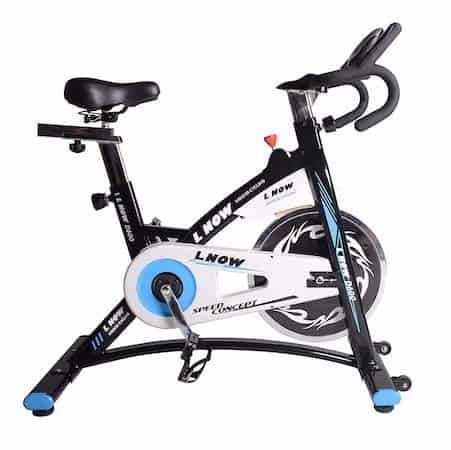 The tiny price tag, solid build quality and sufficient feature set make the Exerpeutic upright bike a considerable option for those on a budget. While the models we’ve already looked at are great for cardio, recovery and weight loss, they don’t replicate the feeling of riding a real bike as well as those listed below. These machines feature advanced, precise designs that can keep up with the demands of cyclists when riding their bicycle isn’t an option. 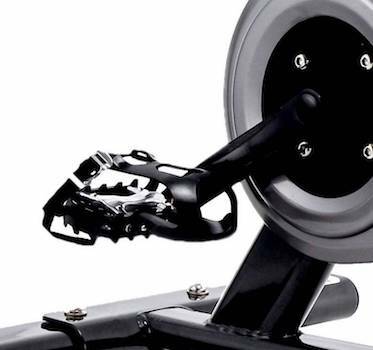 If you’ve heard of Concept 2 before, you’ll probably know that when it comes to innovation and craftsmanship, their sports-based ergometers are second to none. 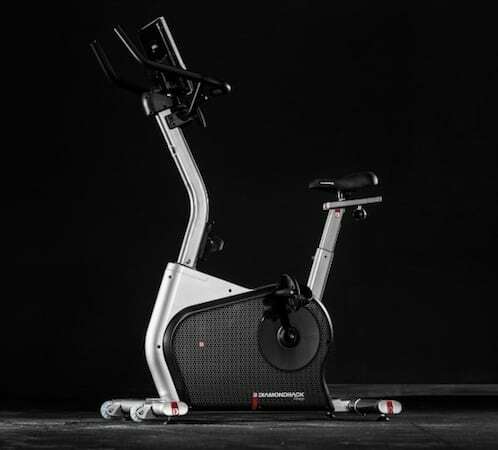 The Concept 2 BikeErg is this company’s single foray into upright stationary bikes and no exception to their creative and manufacturing quality standards. There are numerous unique design elements that make using the BikeErg feel more like real cycling. This includes a flywheel that works through air resistance as opposed to having mechanical resistance levels. The faster you pedal, the more air resistance you’ll experience. This results in a virtually limitless range of intensity. Other real bicycle actions such as freewheeling and changing gears are also possible thanks to the clutch and wide damper range. Along with being able to adjust the standard saddle, handlebars and pedals, you can also swap each component out for those on your bicycle. A PM5 performance monitor allows you to observe a variety of metrics as you cycle. 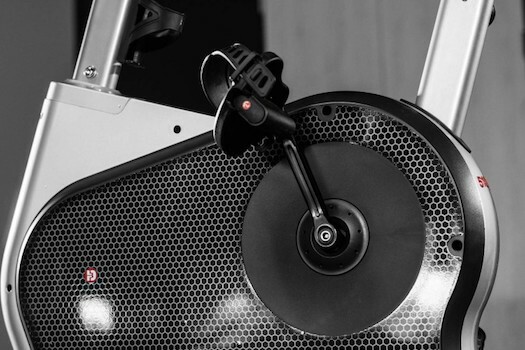 The BikeErg is also much quieter, smoother and durable than most other exercise bikes thanks to the self-tensioning poly groove belt drive. The 510LC is Rep Fitness’ higher end offering and it comes with a couple of upgrades. A more powerful computer provides 14 different workout programs, along with 16 resistance levels and heart rate monitoring. This, along with the standard set of metrics are viewable on the LCD display found between the handlebars. Speaking of which, the handlebars on the 510LC are covered in soft foam and can be adjusted for height, as well as fore/aft positioning. This also applies to the saddle, which is ergonomic and well cushioned. The heavy duty flywheel features a solid construction that helps it build momentum like a real bicycle. 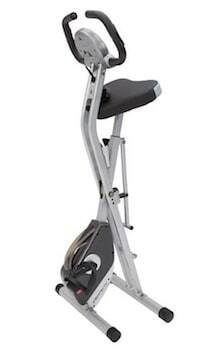 A clean, premium steel frame, stability feet and transport wheels add even more value to the build of this exercise bike. As usual, a money back guarantee and same day shipping come standard with every purchase. L NOW’s most expensive bike is significantly more affordable than those offered by other manufacturers in this list . Yet, it maintains a durable construction and an impressive list of features. As usual, the bike is easy to transport thanks to its compact frame and built-in wheels. The handlebars are similar to those found on road bikes, with three different grip positions that’ll keep you comfortable through long sessions. The saddle is perforated to provide maximum breathability and heat dissipation. Durable straps and cutouts for cycling cleats can be found on the pedals. 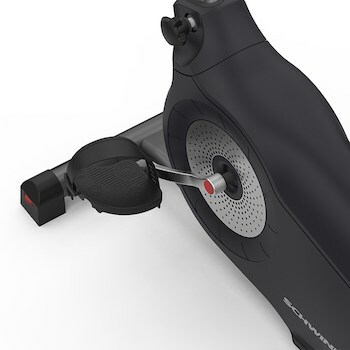 Adjustable feet and a solid steel construction keep L NOW’s exercise bike stable through hard bursts. 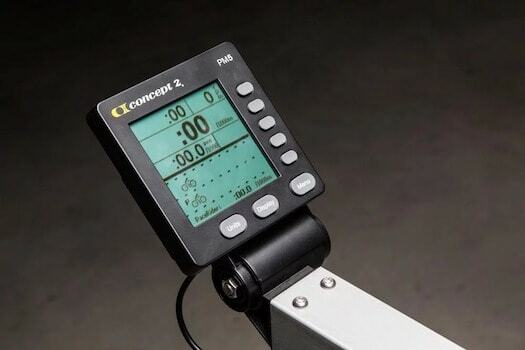 The precision made flywheel features numerous resistance levels while an LCD monitor displays all the metrics you need. 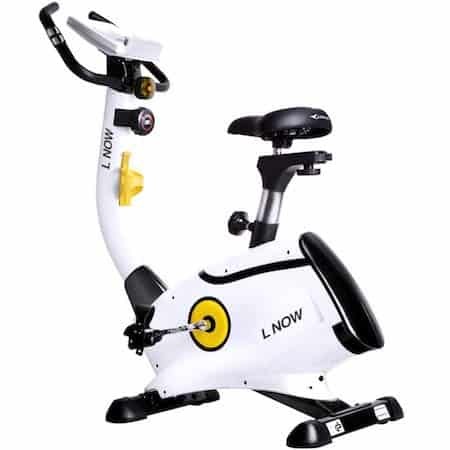 If you want a high end bike without a high end price tag, the L Now Indoor Cycling Bike is a considerable option. Even though comfort is probably the last thing you’d expect to feel when working out, it’s essential for an enjoyable exercise bike session. The most important factor that influences this is build quality. You don’t want to deal with a frame that’s falling apart, a flywheel that squeaks or a seat that digs into your glutes. A stable and durable exercise bike is usually built on a thick H pattern frame with good tubing. The flywheel should be precision machined and properly attached to run smoothly and quietly. If you have kids around the house, a frame with enclosed mechanics will go a long way in preventing any accidents. What you sit on is where you’ll feel the biggest difference in comfort. Ensure the seat is properly padded, adjustable and shaped to your liking. Some people prefer flatter seats, whereas others will find a contoured design more comfortable. Additional features such as the built-in computer and accessory support should be your next consideration. 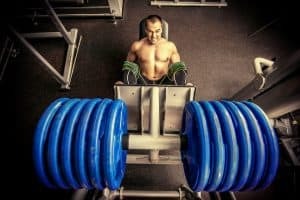 If you want a more detailed look at your workouts, ensure the computer is able to track and display a healthy list of metrics. Comfort features such as fans, speakers and smartphone connectivity options can make workouts a lot of fun. Well, there you have it: The best upright exercise bikes for almost anyone. To figure out which one will best suit your needs, keep in mind the type of workout you’ll be doing on your bike and just how many of those features you truly need. 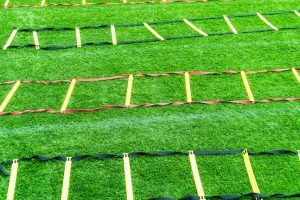 If you simply want to do some cardio in a fun and risk-free environment, then a more affordable model will suffice. 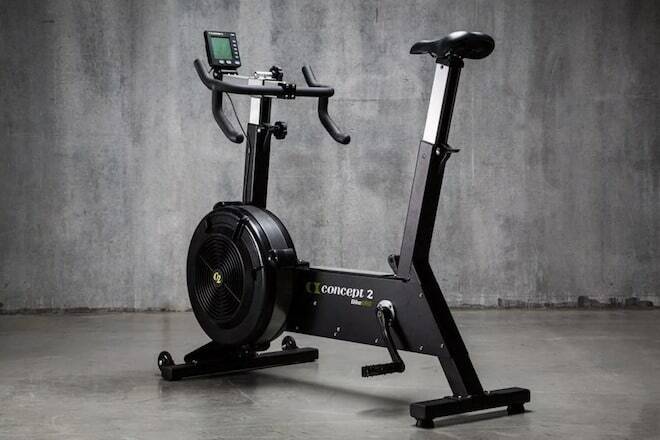 If you demand only the best and want to replicate the exact feeling of riding your own bicycle, a higher end offering such as the Concept2 BikeErg exercise bike is the way to go. Either way, you’ll be investing in a fun and effective piece of gym equipment that will keep you fit for as long as you can pedal. Before we finish, it’s worth noting that upright bikes can present problems for people with joint problems, especially hip, back, wrist and neck. If this is you, recumbent exercise bikes are a great alternative that place very little stress on joints.